Jets 'What If?' - Adam Lowry or Mathieu Perreault? 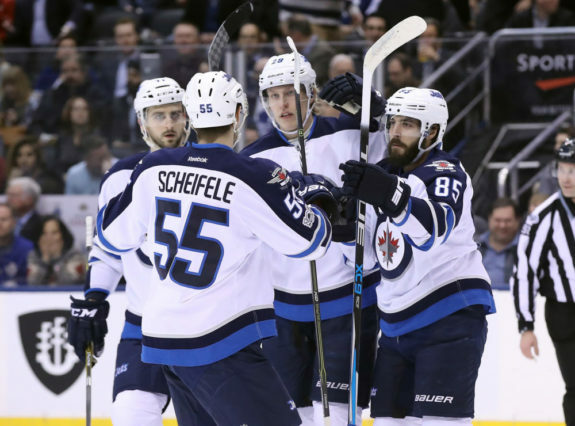 Jets ‘What If?’ – Adam Lowry or Mathieu Perreault? The Winnipeg Jets, in an ideal world, will not have to choose between Mathieu Perreault and Adam Lowry when the time comes to protect people ahead of the expansion draft. It’s a distasteful thought for Jets fans, losing either of their prized forwards in the upcoming event. If the Jets play their cards right, it will be nothing more than an unpleasant what-if. Suppose, however, that the Jets are not able to protect both of these players. Suppose, for one unpleasant moment, that Toby Enstrom doesn’t agree to waive his no-movement clause and the Jets go the four-by-four route in their expansion draft protection plan. If that happens, either of these players would certainly be snapped up by the Vegas Golden Knights. Lowry, a young, physical centreman with great size and decent scoring touch would be a no-brainer, despite his soon-to-expire contract. And Perreault was one of the Jets’ most effective point-producers down the stretch. Perreault is not old by any means at 29. And his contract is set for the next four years after this one at a reasonable rate of $4.125 million dollars per season. Not a bad price tag for a player who’s produced consistently for most of his career. In short, this is not a player Vegas would pass up. To expose him is to lose him. So why would they? The Jets wouldn’t be that crazy, would they? I have no doubt Winnipeg will do everything in their power to protect seven forwards. If that means getting Enstrom to waive his NMC, I’m sure they’ll try (though neither side will say whether they have yet, and won’t before the expansion lists go public). If that means cutting a back-door deal with Vegas, giving them a pick or prospect in exchange for an agreement not to take Tyler Myers being the most likely, I’m sure they’ll attempt that as well. But let us pretend for a moment that the Jets explored both options and encountered dead ends. If that’s the case, what then? Do the Jets protect Lowry or Perreault? For some, this debate is already over. 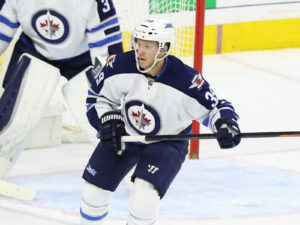 Some consider Perreault among the Jets’ best three forwards, including Jets Nation’s Garret Hohl, who made a compelling case for Perreault’s standing in Winnipeg. Lowry is not without his merits, however, size being the most immediate and obvious. The NHL may be changing, but big centremen are still at a premium. At 6’5, Lowry is among the biggest, and his faceoff percentage is improving as well. It’s worth noting that when it came time to look at the Jets, THW’s own Keith Scheessele didn’t even consider Lowry as an option for Vegas as he assumed the Jets would protect their home-grown centreman. Keith isn’t alone there either. Many believe the Jets hold Lowry in too high esteem to risk losing him. After a down year in terms of production, Lowry brought himself back up to 15 goals last year. At times, he looked like he could hit 20, and that would be more than Perreault has ever scored in a season. And then there’s the physical aspect of his game. Big, physical centers who can put the puck in the net are always coveted. And there’s really no player like Lowry in the Jets’ system. You could make the argument that the Jets have a ready replacement for Perreault in Kyle Connor, especially given his second-half offensive tear last season. But the one thing that really works for Lowry? His contract. Lowry is the cheaper option, even allowing for the raise he would certainly get when his ELC expires at the end of next season. The Jets aren’t in a cap crunch yet, but they will be soon with Nikolaj Ehlers, Jacob Trouba and Patrik Laine all due for big raises in the next two years. On the cap front, losing Perreault would make things easier. In every other way, however, losing Perreault would be a huge blow to Winnipeg. He may not score goals galore, but he makes them happen. And by every measurable metric, they are a better team when he’s on the ice. Lowry’s underlying numbers leave a lot to be desired. The fact is, at this stage in their careers, Perreault is a top six forward and Lowry is not. Perreault’s offense isn’t something the Jets can just throw away. Yes, they were a high-end offensive team last year, and yes, they have plenty of talent up front but players like Perreault are often the unheralded glue that holds the big time offensive units together. Ask the Colorado Avalanche what happened to their high-end offense the year after they lost Paul Stastny. Losing Lowry would sting, undoubtedly. His size and nastiness, coupled with growing skill, are rare and important traits, and every team could use a good third line center. But losing Perreault would hurt far worse. His presence on the power play and his ability to be plugged into the lineup just about anywhere can’t be replaced in the short term. The Jets need to start thinking short term. At some point, all these prized prospects and shrewd draft choices need to translate into wins. The Jets want, and in some ways need, to get into the playoffs next season. Of these two players, the man best suited to help them do that is Perreault. But it’s all moot, right Jets? You’re going to find a way to protect both, aren’t you? Of course you are! I hope that’s the case because losing either player would hit the Jets where they live. So make it happen, Mr. Cheveldayoff, whatever it takes. Because if either of these players are exposed, their days in Winnipeg are over.